Public consultation on the Avenues project on and around Argyle Street - from from Anderston Cross to Trongate, and through St Enochs Square and Dixon Street down to the Clyde, has now started. This consultation will allow people to give your thoughts on initial designs, and over the course of the weekend, on-street consultation teams will be at various locations along the length of Argyle Street. For those that can't make it to the city centre, the proposals and questionnaire will be available online at www.glasgow.gov.uk/avenues until 13 July. The £115million Avenues project is funded through the Glasgow City Region City Deal, and aims to change the face of the city centre for the better for all those who live, work and visit. 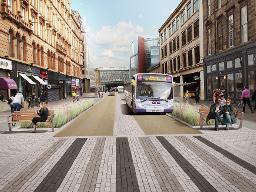 It will see key Glasgow city centre streets redesigned to protect and prioritise space for cyclists and pedestrians, improve connectivity, introduce sustainable green infrastructure through attractive streetscapes and enhancing biodiversity and improve the way public transport is accommodated. The Argyle Street will ask those taking part to consider the proposals and also to imagine how the street might be in the future. We want to know what their feelings are about the provision for pedestrians, for cyclists and public transport. The consultation questionnaire will also ask participants about whether elements such as trees and greenery - along with space for outdoor events and activities - are important to them. The feedback from this consultation, along with feedback that has already been gathered from local businesses and community groups will help to inform the next stage of designs that will be out for formal public consultation towards the end of the year. Councillor Susan Aitken, Leader of Glasgow City Council, said: "The Avenues programme will transform the city centre in the coming years, and is a great example of what will be achieved for Glasgow through the City Deal. The Avenues will deliver a city centre that is better connected, more attractive, and capable of bringing economic growth to residents and businesses, but we want to have the views of as many people as possible to help shape the final design of the project into something that meets the needs and aspirations of the huge number of people and organisations who use the area. Please take part in this consultation."